The topmost row of hexes is the surface of the Genesis Planet, whilst the next three rows are atmosphere. The Grissom is moving left to right three rows below the atmosphere, speed 1, with all weapons and shields lowered. The B’rel starts somewhere in the lower left corner of the board, cloaked at speed three. No ramming. The Grissom may not raise shields, power weapons, or leave orbit until after the B’rel has decloaked. 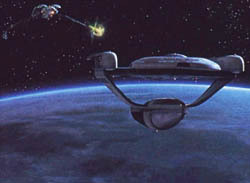 A major victory is accomplished if the Grissom is unable to go to warp or fire its phasers. A minor victory is accomplished if the Grissom is destroyed. A major victory is accomplished if the B’rel is forced to withdraw or destroyed. A minor victory is accomplished if the fight lasts longer than thirty turns (as the Enterprise is en-route). Kruge detected the Grissom, and stealthily crept up into firing position. By jamming the communications, his position was inadvertently given away, but it was not enough for the Grissom’s crew. With a single shot, the Oberth class vessel was accidentally destroyed. For his error, Krudge’s weapons officer was executed immediately.